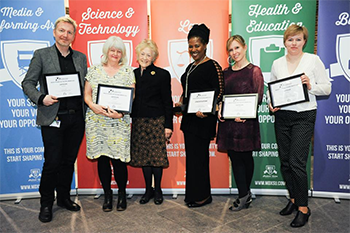 The winners of the second annual Middlesex University Teaching Awards have been announced. At a ceremony held in the Rickett Quadrangle, six outstanding members of staff were presented with awards by University Chancellor Dame Janet Ritterman, Chief Marketing Officer Katie Bell, Students' Union Vice-President Sarah Bennett, Vice-President Elect Andre Thompson and President Aman Siddiqi. More than 700 student nominations were received this year across five categories, with the shortlist created by a panel of students and elected student officers. The prestigious award for Most Empowering Teacher went to Senior Lecturer in Criminology Dr Anastasia Karamalidou, who was described as "an exceptional individual" in her nomination. Reflecting on the award, Dr Karamalidou said: "This is a great honour that is particularly special for me since it represents the students' choice. "Being voted Most Empowering Teacher reflects the quality of our students' learning experience at Middlesex University in general and in the Department of Criminology and Sociology in particular, which for a second year in a row has won the award [Dr Erin Sanders-McDonagh was awarded the inaugural prize]. "My award celebrates my approach to teaching that enables both my students and I to create a learning environment in which we feel free to critically reflect, debate and engage in a dialogue with each other with the sole aim to improve ourselves personally and academically, and to equip my students with skills for a life after university." Most Inspiring Teacher was given to Claire Lewis, Lecturer in BA Graphic Design, who was similarly thrilled: "I was completely overwhelmed to be nominated for this award and speechless that I won it. "I consider myself extremely lucky to have the job that I do, as every day I get to work with students who are creative, enthusiastic and eager to learn. The fact that it was the students who nominated me for this award is what makes it so special." Also recognised were Senior Lecturer in Early Childhood Studies and Education Angela Scollan for Best Feedback; Senior Lecturer in Environmental Science and Engineering Dr Steve Kett for Most Innovative Teaching; and Graduate Academic Assistant in Sport Science Oliver Rix for Best Support Staff. There was also a special award presented to Senior Lecturer in Mental Health Nursing David Price for Outstanding Compassion. David provided "amazing support … far above and beyond his role as a lecturer" to one of his students, Linder Matonga, after she was diagnosed with cancer. Linder said: "I don't think he realises how much of a difference he has made in my life. David deserves a special award for all that he has done for me." Click here to read the full list of nominees and winners.